A Bicycle Tour of Historic Lexington. Cycling Through History was created by the Blue Grass Trust for Historic Preservation. The numbered stops on the map indicate historic sites and other sites of interest along the designated route. In addition, historic markers can be read along the way. 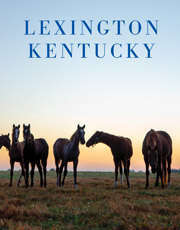 All the streets and points of interest in Lexington could not be included in this tour; if you have the time, don&apos;t hesitate to explore on your own! The complete tour on this map and is about 11 miles long. The tour map has several shortcuts, all of which are indicated by dashed lines. The tour begins in the parking area at the rear of the Hunt-Morgan House, located in the Gratz Park historic district. The parking lot across West Second was the site of the Bradford House (home of Lexington&apos;s first newspaper publisher). Its destruction in 1955 and the potential demolition of the Hunt-Morgan House for another parking lot was the catalyst for the formation of the Blue Grass Trust for Historic Preservation, and the beginning of the modern historic preservation movement in Lexington. The Hunt-Morgan House was built in 1814 for John Wesley Hunt who was known as the first millionaire west of the Alleghenies. His business empire included interests in banking, horse breeding, agriculture and hemp cultivation and processing. He died in the 1849 cholera epidemic. The Hunt-Morgan House serves as an outstanding example of Federal style architecture anchoring the historic antebellum core of the city. Notable architectural features include a fine pedimented facade with a Palladian window above. Commonly found in the Deep South, the porch along the south wall is the only example of this feature in Lexington. John Hunt Morgan, the Confederate General of Morgan&apos;s Raiders&apos; fame, and Thomas Hunt Morgan, winner of the Nobel Prize in physiology in 1933, are also associated with the house. Exit from the parking lot and turn right on West Second Street. Proceed to the intersection with North Broadway (the first traffic light) one block ahead. Cross the intersection and continue on West Second. You are now in the Northside Historic District, a large district that extends to West 6th Street. Development patterns include juxtaposed blocks, many based on subdivisions of the very large original town outlots. The Northside District contains a variety of socio-economic levels, as well as a wide variety of architectural styles. This district is characteristic of development in Lexington over a long period of time; from 1800 through the 1920s. A historic marker designates the Breckenridge House on the right. Continue until you reach Stop 2, the Thomas January House at 437 West Second. This two-story gray house with columns in front was built in the early 1800s for Thomas January, a hemp cultivator. After 1820, it was used for various non-residential purposes including an Episcopalian Seminary in 1834. In the early 20th century, it became the Campbell-Hagerman College for Girls, then the Lexington Conservatory of Music and today is a private residence and apartments. Several notable architects are associated with the property including Thomas Lewinski, who is credited with designing the monumental Ionic portico, and John McMurtry who designed a unique screen of interior Ionic columns separating the west room from the reception hall. The Colonial Revival structure at 441 West Second Street was built around 1905 as part of the Campbell-Hagerman College for young women. This tall, narrow brick building, with an added Ionic portico contained classrooms and music rooms until the college closed in 1912. Along with other uses, the building was part of Anna Chandler Goff&apos;s Lexington School of Music until it was converted into apartments when that school closed. Across the street at 444 West Second is the former Elks Club Lodge. Built in the early 1870s in an Italianate Greek Revival style, it was enlarged and altered to a more convincing Greek Revival style in the late 1800s. Architect John McMurty probably built it and made the alterations. After 1940, it was used as the office for the Coca-Cola plant that was located behind it on West Short Street, then later as an Elks Club. It is still used as a commercial building. The lots on the north side of this block of West Second are often 325 feet or more deep. They back up to lots on West Third Street that are even deeper. A hemp rope factory and ropewalk were located in the middle of the block. The owners of the hemp processing facility usually lived in large houses on West Second, West Third, or in between on North Broadway - close to their livelihood. Continue down West Second and through the light at Jefferson Street. You will pass the Jefferson Center that previously was the Second Street YMCA. Before that, it housed nuns who worked at the old Saint Joseph Hospital located across the street on West Second. The 10-story Connie Griffin Manor (resident housing for seniors) is now located there. At the stop sign at Old Georgetown Street turn left and continue until you reach Stop 3. You are now in the Western Suburb Historic District. Platted in 1815, the Western Suburb is one of Lexington&apos;s oldest actual suburbs, if not the oldest. Purchasers and tenants of houses in the then new subdivision included many merchants who found it convenient to live close to their downtown businesses. Houses here date from 1795 (the Matthew Walker house around the corner to the right at 728 West Short) to 2006 (the copper-clad house behind you). Its varied architecture reflects more than 200 years of styles and economies, and was the hub of much of Lexington&apos;s history. Old Georgetown Street was US-25, part of the Dixie Highway that served as the major north-south route, running from Sault Ste Marie, Michigan through Lexington, terminating in Miami, Florida US-25 was re-routed in the mid 1960&apos;s.
Stop 3 is the copper-clad house on the right at 151 Old Georgetown. The property was designed and largely built by architecture and historic preservation students in the University of Kentucky&apos;s College of Design, along with input from professional architects. It is one of the very first properties in Fayette County to become LEED certified. LEED certification is a voluntary, national standard for developing high-performance environmentally sustainable buildings. Ballard Street , directly across from the copper house, was previously named Ballard Alley. It was populated mostly by small shotgun houses, and was a vibrant, mainly African-American community until 1980 when Ballard Place was built as an expansion of the Connie Griffin Manor on West Second. Only a handful of houses from before 1980 remain there. Note the three buildings on the east side of Old Georgetown. These are typical of the late 19th and early 20th century arrangement of having living quarters above an owner&apos;s shop. They are located at 170-172 Old Georgetown, 152-154 Old Georgetown (on the northeast corner of Ballard and Old Georgetown, built before 1886), and 651 West Short Street (on the northeast corner of Old Georgetown and West Short). Immediately to the south of the copper house, is a Greek Revival cottage at 147 Old Georgetown. Known as the James Crutcher house, it dates from 1847. Across the street from the copper house at 146 Old Georgetown (on the southeast corner with Ballard Street) is a house originally built in the early 1800s. In 2003, it was completely renovated by a local carpenter using 19th century tools. To the immediate north of the copper house is the Abraham S. Drake House. It dates from the early 19th century and was used from the early 1940&apos;s to around 2003 as the Nathan Calder American Legion Post - an African-American, American Legion Post. It is now part of the Artek development, and is used for office space. On the north end of what is now the Artek complex was the Williams House built in 1815 and destroyed by fire in 2000. It became known as the Cunningham Funeral Home through most of the 20th century, and was the oldest African-American owned business in Lexington when the Cunninghams sold it around 1990. In addition to the Artek complex built as infill housing in 2007, there are several infill houses surrounding the northwest corner of Old Georgetown and West Short. From the mid-20th century until just before 1980, that land was used to park all of the City of Lexington&apos;s garbage trucks. On many nights the whole neighborhood vibrated as the trucks warmed up for their morning runs. In 1990, the Historic Western Suburb Neighborhood Association purchased the land from the city and developed the infill housing. By 1910, Lexingtonian and former 7-year-old newsboy, Billy Klair, had become the kingpin of Fayette County politics. When he died in 1937 at age 62, he was the most powerful politician in Kentucky even though he had held no elected office for most of his reign. The house he lived in during that period is at 646-648 West Short, at the southeast corner of West Short and Old Georgetown. Portions of the house date to 1825. Proceed on Old Georgetown to West Short Street. Turn left and continue for a block to the stoplight at Jefferson Street. (Proceed to Stop 6 if you desire to eliminate 0.8 miles from your tour.) Turn right on Jefferson. Proceed on Jefferson, to the stoplight at West Main Street (Stop 4). The building on the northwest corner of Jefferson and West Main (601 West Main) housed one of Lexington&apos;s most popular restaurants, Roger&apos;s Restaurant, before they relocated in the mid-20th century. This late 19th century, Victorian Commercial style building housed a neighborhood saloon and grocery. To the west of 601 West Main (609 and 611 West Main) are two houses dating from 1855 and pre-1833, respectively. The 1833 frame house at 611 West Main was probably built over an original log structure. It provides an interesting change in scale and fabric to the streetscape. Looking to the east (left) down West Main on its south side is a red brick house (at 574 West Main) that is the Mary Todd Lincoln House museum. The house, built sometime between 1807-1812, was originally constructed as an inn and was a prominent tavern in town for twenty years. It was home to the Todd family in the 1830s-1840s. Mary Todd Lincoln, wife of President Abraham Lincoln, 16th President of the United States, lived there with her family prior to her marriage to the future president and after his death. Proceed across West Main and onto the Jefferson Street Viaduct. This will take you to the "T" intersection of Jefferson Street with West High Street. Turn right on West High and try to get into the left lane. After a very short block, turn left on Madison Place. You are now in the Woodward Heights Historic District. Continue to 341 Madison Place, Stop 5, also known as Botherum - the third house from the end of Madison Place, on the right. The unusual architectural character of this house, built in 1851, is probably reflective of its eccentric owner, Colonel Madison C. Johnson, who graduated with honors from Transylvania University at the age of fifteen. John McMurtry, the architect for the house, combined two historic styles of architecture in its design, which together made the house one of the outstanding examples of romantic architecture in America. In 1886, Johnson&apos;s heirs sold Botherum and the estate to J.C.Woodward. Woodward platted Woodward Heights and then sold building lots to individual owners. 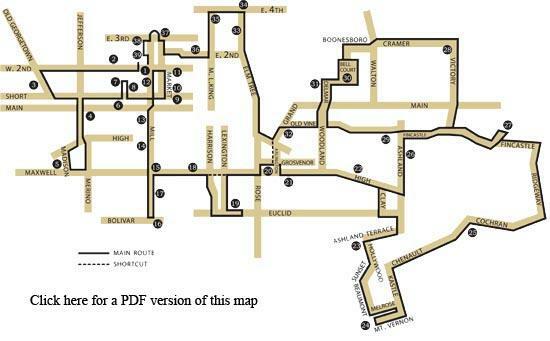 The area is located above the Town Branch of the Elkhorn Creek and is defined by Maxwell and High Streets, west of the Civic Center to where they join, and cross streets of Madison Place and Merino Street. Houses in this area date from the late 1880s on into the 20th century. After many properties were allowed to fall into disrepair, the residents of the area worked to have it designated as a historic district. Many have expended significant effort to restore this wonderful turn of the century neighborhood. Go up to the corner where Madison intersects Maxwell Street. Turn left on Maxwell and go one block to Merino (named by a 19th century developer after a type of sheep). Turn left on Merino, past the neighborhood fire station on the right corner, and proceed a block to where Merino terminates into West High Street. Turn left, then right almost immediately back onto the Jefferson Street Viaduct. Continue over the Rupp Arena parking lot, and proceed past the West Main Street intersection, and up the short hill back to Short Street. Turn right onto West Short Street. Proceed on West Short, stopping in front of the small house on your right at 520 West Short Street (Stop 6). From this point, one can see several sites. The old buildings on the south side of the street (520 and 522 West Short) were built as a double house around 1836. The First Baptist Church, across Felix Street on the same side of West Short, is located on the site of the congregation&apos;s original 1789 log meetinghouse. It is also the site of Lexington&apos;s earliest burial ground, used until after the 1833 cholera epidemic. The current building, when dedicated in 1915, covered the largest square footage of any Baptist church in the world. The magnificent sanctuary contains superb timberwork over-arching the auditorium. The original pews and brass chandeliers continue to be used today. The fort-like townhouse complex at 541 West Short, on the northeast corner with Bruce Street, was started in the late 1970s and early 1980s, then completed about 1990. It was built on the site of the old Coca-Cola plant. An excellent example of an Italian Villa, the Parker house at 511 West Short was built in 1870 by John Wilgus. Wilgus, a grocer, obtained the property in 1855. In the early 1850s, architect John McMurtry had a lumber yard and carpentry shop there. Before that, it was owned by Elizabeth Parker, Mary Todd Lincoln&apos;s grandmother. Currently used as a private residence, there are also offices in a rear addition. A log cabin obtained from property owned by the Parkers has been placed at the rear of the house. Parker House has also been an orphanage, antique shop, museum, and reception hall. The ca. 1900 Richardsonian Colonial Revival Cottage (521 West Short) was built on land that once belonged to the Parker family. The St. Paul&apos;s Catholic Church building dates to 1865. Its exterior is dominated by a 210 foot tower topped by the first church clock in Lexington. Its rectory, built in 1886, located to the west of the church building, is a handsome example of the late Richardsonian/Queen Anne style. It was built on the site where Mary Todd Lincoln was born on December 13, 1818. Directly to your east, on the south side of the street, is a church thought to have been built around 1920. Before the civil war, this was the site of a theater and a jail. Ride on for a very short distance and turn left on Saunier Street. This street runs behind the Opera House. Continue on up to 171 Saunier (Stop 7). Constructed around 1895, this Richardsonian Romanesque style stable was built for the Nicoll & Thomas Sale stables. The stable served a number of businesses, including the Kerr Brothers undertaking establishment and later a part of the Saunier Brothers&apos; ironwork shop. The building features an elaborately stone-trimmed facade with round-arched doors, brick pilaster strips, and a glass monitor at the center crest of the roof-ridge that lights the interior. Next, retrace your path down Saunier, turning left on West Short and continuing on to the intersection with North Broadway. The Lexington Opera House, on the northwest corner, was built in 1886 and beautifully restored in 1975. It became known as the "best one night stand" in America at the start of the 20th century. Al Jolsen, Will Rogers and Fanny Brice were among the many whom have graced its stage. The Square (formerly Victorian Square) , on the southwest corner, is one of the first and most notable examples of adaptive reuse in Lexington. Once a city block of furniture retail stores housed in adjacent Victorian style buildings, these structures have been united in a complex of shops, restaurants, galleries, offices and other endeavors. One block north at 154 North Broadway, the Centenary Methodist Church, built in 1869 by Cincinnatus Shryock, is visible. The building features polychrome masonry and pronounced horizontal lines, both characteristics of the Venetian Gothic style. Cross North Broadway and continue on West Short while taking notice of the 180-year-old building at 309 West Short (on your left before North Mill). This is Lexington&apos;s oldest surviving post office (ca. 1830). The building to its west at 311 is a remnant of the 19th century Reed-Drake Hotel. On your right at 300 West Short (on the southwest corner of West Short and N. Mill Street) is a building that began as a pharmacy in 1905. It became Sageser Pharmacy from 1930 to around 1970, after which the building was renovated and converted to law offices. Continue to Cheapside Park, on your right at the southeast corner of West Short and Cheapside (Stop 9). From Stop 9, one can see the old Fayette County Courthouse, built in 1898 in a Richardsonian Romanesque architectural style, bordering Cheapside Park. It is currently under renovation. One can also see the new Courthouses (ca. 2002) two blocks to the east. Across the street at the northwest corner of West Short and Market is 249 West Short (ca. 1889-1890), remodeled in 1962). Note the restrained Richardsonian style building (ca. 1895) located at 129-131 Cheapside on the southwest corner of the West Short intersection. The building in the middle of the block at 115 Cheapside is original underneath its 20th century facade. It was built for Matthew Elder in 1807. Imagine what West Short looked like in the mid-20th century when most of the buildings resembled the historic structures that are still standing today. Cross West Short to Market. Proceed north on Market to Church, stopping at the corner of Market and Church (Stop 10). On the northeast corner is the Christ Episcopal Church Cathedral, built between 1848 and 1849. The current building is the fourth church to be erected on the site, and was designed by prominent 19th century architect Thomas Lewinski. Henry Clay, John Bradford, John Hunt Morgan, and Mary Jane Warfield were among the many well-known members of this congregation. Proceed north on Market to the intersection of Market and West Second (Stop 11), at the southeastern edge of Gratz Park, Lexington&apos;s first historic district. Gratz Park started out as home of the then Transylvania Seminary when it moved to Lexington from Danville, Kentucky in 1789. After the main campus building burned in 1829, Transylvania moved across Third Street. Dedicated as Centennial Park in 1876, the park was later named in honor of Benjamin Gratz, a park resident and prosperous hemp grower. The area has been associated with prominent Lexington citizens throughout its history. Federal and Greek Revival house styles abound. Houses were developed along the Park in the early part of the 19th century. Several infill houses date from the turn of the 20th century. On the southeast corner of Market and West Second is the Ridgely House (190 Market). Built in 1794, it is the oldest structure bordering the park. The first owner, Dr. Frederick Ridgely, delivered the first medical lectures in the west at Transylvania. On the northeast corner, the Bodley-Bullock House was built in 1834, and served as Union Headquarters during the Civil War. The house was named for General Thomas Bodley and 1912 purchaser Dr. Waller O. Bullock, founder of the Lexington Clinic. On the northwest corner is the Carnegie Center for Literacy and Learning, formerly the Lexington Carnegie Library. The library was built in 1905 with funding from Andrew Carnegie and served as Lexington&apos;s main library until 1988. From 1886 to 1917 more than 2500 libraries were built in English speaking countries around the world from grants provided by Andrew Carnegie. Of the 1,679 built in the United States, 27 were built in Kentucky. On the southwest corner at 226 West Second is the Wooley House. Dating from 1841, the architectural style is Greek Revival. At one time, Samuel Roberts, founder of the Lexington Leader newspaper, lived here. Turn left on West Second and proceed a short block to North Mill Street. At this point, if you desire to terminate your tour, the Hunt Morgan House - where you started out at Stop 1 - is at the northwest corner of West Second and North Mill Streets. You will have traveled 2.3 miles. Turn right (south) on North Mill Street and continue a very short distance to the First Presbyterian Church and Henry Clay&apos;s law office (Stop 12). These are located at 171 and 176 N. Mill, on the east side of the street about midway in the block. The current First Presbyterian Church building, built in 1872, was designed by Cincinnatus Shryrock, one of Lexington&apos;s foremost 19th century architects. The 180-foot tall tower is the church&apos;s most striking exterior feature. The church still has its original pews. Young Henry Clay defended Aaron Burr, then Vice-President of the United States, when he appeared before a grand jury in Frankfort, Kentucky after being accused of trying to get western states to secede from the Union. Clay&apos;s brick law office, which he built and occupied from 1803 to 1810, measures only 20 x 22 feet. Clay probably interviewed Aaron Burr in this very building. This building is one of the few early, professional buildings remaining in Lexington. In 1830, it was incorporated into a larger building. The State of Kentucky purchased and restored the law office in 1971. The First Presbyterian Church now owns it. Continue south on North Mill, past Church Street and the Arts Place building, through the stoplight at West Short Street, stopping at the intersection with West Main Street (Stop 13). The southwest corner of South Mill and West Main is where the settling of Lexington began. A blockhouse was built in 1779, eventually being expanded into a fort that stood largely between South Mill and South Broadway Streets on West Main; its northern edge stopping in the middle of what is now West Main. Proceed on Mill Street through the West Main intersection (where North Mill becomes South Mill) and continue on through the West Vine Street intersection, up the hill and through the West High Street intersection. You are now entering the South Hill Historic District. This district is characteristic of development in Lexington over a long period of time. As in the Northside Historic District, a large proportion of Lexington&apos;s major public, political, legal, military, financial, cultural, educational and religious leaders have lived in this district throughout its history. Many of the houses in this residential area were built in the early 1800s. Continue a little further on South Mill until you reach the Adam Rankin house on the west (right) side of the street (317 South Mill), the oldest house in Lexington, built in 1784 (Stop 14). Until the 1970s, the Adam Rankin house (clapboard on log with a beam addition) was located at 215 West High, on the north side of the street. It was moved during the Urban Renewal project that removed most of the historic houses on the north side of the downtown portion of West High Street. A slaveholder, Adam Rankin was a fiery, eloquent Presbyterian minister credited with publishing the first book in Lexington, in 1793. Its topic was Psalmody, a singing of the biblical Psalms using hymns composed by Isaac Watts (including Joy to the World) with which he disagreed. He rode by horseback to Philadelphia in 1789 to attend a Presbyterian conference to state his case. His cause was not successful. Across the street and further south is 340 South Mill, an early example of adaptive reuse. It was originally built as an ornate carriage house in 1812 for a large home named Rokesby Hall (318 South Mill). In 1836 when Rokesby Hall was sold, the new owner converted the carriage house into a residence. For twenty years immediately after the Civil War, this Federal style carriage house was the home of Henry King, an African-American painter. Today it remains a single family home. Continue south on South Mill passing many interesting and historic houses until the intersection with Maxwell Street (Stop 15). On the northeast corner is Dudley Square, formerly Dudley School, built in 1881. The structure is an excellent example of late 19th century school buildings. In 1979 a major renovation was executed during which the original woodwork and Italianate details were sensitively maintained. The building, which has gone through some recent renovations, contains a variety of commercial spaces and is a successful example of adaptive reuse. Also note the brick shotgun house across West Maxwell Street and to your right. It has been restored for use as a hair salon. Cross Maxwell Street and continue on three blocks until the end of South Mill where it intersects with Bolivar Street (Stop 16). On the south side of Bolivar Street are the University Lofts and South Hill Station. Located in former tobacco warehouse and processing plant buildings, they are excellent examples of innovative adaptive reuse. Turn around and go north on South Mill for two blocks stopping at Pine Street (Stop 17). On the northeast corner (432 South Mill) is a house built by J. B. Wilgus as an investment around 1846. It is an excellent and well-preserved example of a Greek Revival townhouse. The house at 505 South Mill has gone through repeated remodeling, but it still retains much of its original Federal proportions and balance. Continue north on South Mill, returning to West Maxwell. Turn east (right) on West Maxwell Street, pass the little brick shotgun style structures on your right (built in 1882) that have been converted to shops. Continue through the Upper Street intersection until you get to the intersection at South Limestone. Cross South Limestone and stop. You should be at the southeast corner of South Limestone with Maxwell (Stop 18). Looking north, down South Limestone Street from the northwest corner of this intersection, one can see a string of Victorian houses. Joined together, these were previously called the Kimball House Motel before being converted to condominiums in 2007. This is another adaptive reuse of a longtime Lexington landmark. Turn right (east) on Maxwell (now East Maxwell) and continue for a block to South Martin Luther King Drive. Turn right (south) on Martin Luther King and go to its end at Avenue of Champions. Turn left and proceed 1½ blocks to the front of Memorial Coliseum (Stop 19) on the north side of the street. Note the distinctive Art Deco overtones. Completed in 1950, the coliseum seats 8500. It is dedicated to Kentuckians who died in World War I and in the Korean War. It was home to the University of Kentucky Men&apos;s Basketball team until 1976. It now houses the Women&apos;s basketball, volleyball, and gymnastics teams. Ten NCAA Men&apos;s Basketball Tournaments were held there. Stoll Field, the site of University of Kentucky football games and July 4th fireworks displays until 1973, was located on the south side of the street and east toward Rose. The space is now occupied by The Singletary Center for the Arts as well as practice fields for the U.K. marching band and intramural sports. Turn around and go west on the Avenue of Champions to Lexington Ave. Turn right on Lexington and head north to the intersection with East Maxwell Street. Turn right (east) on East Maxwell. Continue on another block to Rose Street. Turn left (north) on Rose and go a block to Grosvenor Street. Turn right (east) on Grosvenor. Go to 326 Grosvenor (Stop 20), the Pope Villa. You are now in the Aylesford Historic District. Aylesford Historic District is probably the largest and most diverse neighborhood in Fayette Co.
Pope Villa has been referred to as "one of this country&apos;s greatest treasures." It was designed by Benjamin Henry Latrobe, and built in 1811 for Eliza and Kentucky Senator John Pope. Eliza Pope was the sister-in-law of John Quincy Adams. One of America&apos;s first professional architects and the most talented designer of the new republic, Latrobe was responsible for the design of the U.S. Capitol Building. He developed an American neoclassical architecture of elegantly austere exteriors that contained interiors rich in variety. The Pope Villa is Latrobe&apos;s best surviving domestic design. Over time, subsequent owners so extensively altered the house that knowledge of Latrobe&apos;s connection with it was nearly lost. Following a fire in 1987, architectural historians were able to confirm Latrobe&apos;s patrimony. In that same year, the Blue Grass Trust for Historic Preservation bought the fire-damaged villa and began an extensive program of restoration that continues to this day. Leaving the Pope Villa, proceed east on Grosvenor to the end of the street where it intersects Arlington Avenue. (Turn left on Arlington and skip to Stop 33 if you desire to eliminate 5.25 miles from your tour.) Turn right (south) on Arlington and return to East Maxwell Street. Turn left onto East Maxwell and continue past the next street. Stop in front of the house at the southeast corner of Aylesford Place and East Maxwell - 418 East Maxwell (Stop 21). This house, the one further east at 428 East Maxwell, as well as one at 337 Linden Walk (back a block west) are three of the houses remaining that were designed and built by woman architect, Magdalen McDowell, in the early 1900s. McDowell, extraordinary in her time, worked in a man&apos;s profession and designed houses that were different from other houses built during the time. Her designs reflected not only an artistic effect but also a plan that would provide convenience for the woman that would reside in the house. Proceed further east on East Maxwell (passing by the 100-year-old late-Victorian era fire station at the corner of Woodland and East Maxwell) past the intersection with Kentucky Avenue where East Maxwell merges with East High Street to become two-way. Continue on for a block to Oldham Avenue (Stop 22). Across the street on the north side is Woodland Park. Woodland Park is the former site of Kentucky University&apos;s Agriculture and Mechanical College, established by the Commonwealth of Kentucky in 1865 and forerunner of the University of Kentucky. The area formerly occupied by the College became Lexington&apos;s Woodland Park through a land swap with the Commonwealth. Olmstead Brothers, the famed landscape architecture firm, designed the park. Turn right on Clay Avenue. Continue for a block to Euclid and turn left. Continue to the stoplight at South Ashland Avenue. Turn right on South Ashland and continue for a block to Ashland Terrace. Turn right on Ashland Terrace. Go one block to Hollywood Drive (Stop 23). You have now entered the Hollywood Terrace neighborhood, an outstanding example of an early 20th century suburban Lexington subdivision, developed at a time when massive growth was occurring in the area southeast of the city&apos;s earliest settlement area. The neighborhood reflects patterns of local growth spurred on by post-WWI prosperity and the extension of streetcar lines outward from downtown. Although the Bungalow is the neighborhood&apos;s most prevalent architectural style, you will also find single-story Arts and Crafts style cottages, American Four-Squares, and a few examples of Colonial Revival and Tudor Revival styles. Turn left on Hollywood Drive. Go for a block to Sunset Drive. Turn right on Sunset Drive and go a short block to Beaumont Avenue. Turn left on Beaumont. Go for a block to Melrose on the left. Turn left on Melrose for a block until it intersects with Kastle Road. Turn right on Kastle and travel for two blocks, past Tremont, to Mount Vernon Drive. You have now entered the Mount Vernon subdivision. Turn right on Mount Vernon Drive (Stop 24). It is an excellent example of a mid-20th century Lexington subdivision, developed to accommodate the post-World War II growth that was occurring. The Mt. Vernon neighborhood reflects the prosperity of the post WWII years and the influence of the automobile in the American way of life. Although most of the homes in Mt. Vernon were built in the Ranch style, some Colonial Revival cottages can be found in the neighborhood. The Mount Vernon subdivision was the first subdivision built to accommodate the inflow of IBM personnel when the IBM Typewriter Plant opened in December 1956. IBM&apos;s arrival was probably the most significant economic event for Lexington during the 20th century. The Chevy Chase neighborhood was developed from the late 1920s to the 1950s by Henry Clay Simpson on land that was part of Ashland, the Henry Clay Estate. Tates Creek, Chinoe, Cooper and Fontaine roads bound the neighborhood that is identified as the Chevy Chase neighborhood. The streets and sidewalks follow the contour of the land and wind through well cared for single-family homes, apartment buildings, schools, churches and playgrounds. In the early 1950s, land along Romany Road was developed as a small commercial area. Wheeler Drugstore and Papa Diamond&apos;s Barbershop still occupy their original places. There are additional commercial establishments in this area today that draw neighbors to meet, eat, shop, stroll, ride their bikes and participate in community life. When Cochran bends to the right after a block, continue on Cochran. The properties at 409-413, 417-425,429, and 435 Cochran are known as G.I. Row (Stop 25). Construction of these properties began before World War II but came to a halt during the war due to the rationing of building materials. At the end of the war, when Mr. Davis went to the war department to purchase excess war materials, he was told that if he would sell his houses only to returning G.I.s, the material would be free. Mr. Davis agreed to the stipulation and the residences were completed in 1946. Cochran will bear sharply to the left. Continue on Cochran, one block past the Romany Road intersection, to Ridgeway Road. Turn left on Ridgeway Road. Follow Ridgeway two blocks through its intersection with Fontaine until Ridgeway intersects with Fincastle Road. Turn left on Fincastle, past Woodspoint Road to Henry Clay&apos;s Estate, Ashland, on the right just prior to Sycamore Road. Please skip to Stop 27. Continue east for another block on East High Street to the South Ashland intersection. Turn left on South Ashland (Stop 26). You have entered the South Ashland Historic District, which is included the Woodlands National Register Historic District. Its houses were built in the late nineteenth and early twentieth century. A variety of architectural styles of the period are represented with many of the structures reflecting combinations of styles. Included in this district is Woodland Park, which was designed by the Olmstead Brothers landscape architecture firm. Continue on South Ashland until you reach Fincastle Road on the right, a block before you reach East Main Street at the stoplight. (Skip to Stop 29 if you desire to eliminate two miles from your tour.) Turn right on Fincastle Road and continue five blocks through the old and peaceful Ashland Park neighborhood until you reach Sycamore. This neighborhood is part of the National Park Service&apos;s Ashland Park Historic District. As you bike through the Ashland Park Neighborhood, you will notice that it is one of the most unified and aesthetically pleasing neighborhoods in Lexington. Colonial Georgian, Federal, Queen Anne Victorian, Colonial Revival, Dutch Colonial Revival, Tudor Revival and Craftsman are among the architectural styles found in the area, giving the visitor a rich survey of our American architectural history. In 1904, the Clay family hired the Olmsted brothers to create plans for a residential neighborhood on the 600-acre estate. Constructed over a 15-year period, the development was completed around 1930. A short distance past Sycamore on the left is Henry Clay&apos;s Estate, Ashland. Turn into the Ashland Estate&apos;s parking lot, park your bike, and explore the beautiful grounds and estate (Stop 27). In 1811, Henry Clay bought the original land from Thomas Bodley along with a substantial house on it that was built in 1790. Senator Clay lived there the rest of his life. After his death in 1852, the house was found to have a weak foundation. Clay&apos;s son James razed all or part of the house and rebuilt it along the same lines as the original. Leave the Ashland Estate, and turn right on Fincastle Road. Continue west until the third intersection, Irving Road. (Continue on Fincastle back to South Ashland, cross South Ashland to Central Avenue to Stop 29 if you desire to eliminate one mile from your tour.) Turn right on Irvine for one block stopping at the intersection of Irvine and Richmond Road. ( East Main becomes Richmond Road at Hanover Avenue.) Cross Richmond Road to Victory Avenue. You are now in the Kenwick residential area. Continue on Victory until it ends at Cramer Avenue (Stop 28). Note the corner grocery on the southwest corner. The Kenwick area, unlike other subdivisions of the early twentieth century, more closely resembled an urban landscape in its great economic diversity. Kenwick&apos;s architectural styles are quite varied. Most homes are from the 1920s and later, but there are some examples of architectural styles dating from the mid-nineteenth century. The most common architectural styles found in the area are Colonial Revival, Craftsman and Tudor Revival. You will also find a few examples of the American Four-Square. Although many architectural styles are represented in the area, the Bungalow is the primary property type. Turn left on Cramer and continue west for five blocks where Cramer ends at Walton Avenue. Cross Walton, turn left and go a short block to Boonesboro Avenue. Turn right and head west on Boonesboro. Continue on for two blocks to Bell Place on the left. Turn left on Bell Place and proceed to the end of the block. Continue on Central Avenue for 5 blocks to Woodland Avenue. (Skip to Stop 32 if you desire to eliminate 0.8 miles from your tour.) Turn right heading north on Woodland one block to the stoplight at East Main Street. Turn right on Main, then left almost immediately on to Forest Avenue. Head north on Forest for one block and turn right on Sayre Avenue. Proceed east one block to Bell Court. Stop and look to your left. Straight ahead is Bell House and Bell House Park (Stop 30). The surrounding residential area is the Bell Court Historic District. Bell Court is characteristic of development in Lexington in the late 19th and early 20th centuries. Bell Court was a middle-class neighborhood which manifested the "push east" that Lexington experienced during the area&apos;s rapid growth. Bell Court was laid-out in 1906 on a tract of 56 acres. Most of the houses were built by 1915. Five or so acres in the center were reserved for Woodside (now called Bell House and owned by the city). It is a Greek Revival mansion (ca. 1846) designed by Thomas Lewinski and completed for businessman David Sayre, the founder of Sayre School, a private school on North Limestone Street. It was later sold to another successful businessman, Henry Bell. The original house was destroyed by fire in 1884, and rebuilt from plans drawn by Cincinnati architect, William Stewart. The Bell House Carriage House is currently used as a community theater by Studio Players. Continue around the Bell Court area and admire the many Bungalows, pyramidal-roof cottages, and Arts and Crafts and Dutch Colonial houses. A Bungalow of particular interest in this neighborhood is the one located at 531 Russell Ave. This was the childhood home of Clay Lancaster, a famous architectural historian from Lexington. Exit the area heading west on Sayre Avenue (named for David Sayre,). Follow Sayre until it terminates at Forest Avenue. Across the street on Forest and to the south is the Clay Villa at 121 Forest Avenue. It is located just to the right (north) of 117-119 Forest Avenue (Stop 31). It sits back from the street a little. Originally on a 20 acre tract, architect Thomas Lewinski designed this Italianate Villa in 1841 and built it for Henry Clay&apos;s son, James Clay. Turn left on Forest and go to the stoplight at East Main Street. The house on your right (on the northwest corner) is the Pulliam House. The Pulliam House located at 501 East Main St. was built in 1897 in the Richardsonian Romanesque style and later remodeled with a classical porch and frontispiece. K.W. Pulliam, for whom the house was built, owned it until at least 1919. Pulliam was a prominent merchandise broker, President of the Board of Alderman and City Commissioner. Turn right on East Main Street, then turn left almost immediately on Woodland at the stoplight, heading south on Woodland. Continue for a block to Old Vine (Central becomes Old Vine at Woodland.) Turn right on Old Vine heading west. Continue on Old Vine for three blocks until it intersects with Grand Boulevard (Stop 32). On the southeast corner is the old Taylor Tire building. A longtime automobile repair and tire dealership, it was creatively renovated into a complex of shops and offices. The original gas station canopy and window openings remain as references to its former life. Proceed left (south) on Grand Boulevard one block until it ends on East High Street. Turn right on East High Street and continue one block to the stoplight at High and Rose Streets. Turn right (north) on Rose; continue through the stoplights at Vine and East Main. You are now on Elm Tree Lane. As you pass East Short Street, look at the old red-brick three-story building on the right, less than a block away at 333 East Short Street. It was built in 1897 to augment an 1814 house that had been made into the Good Samaritan hospital in 1899. That house would have stood about where Elmtree Lane is now. The large annex was used as part of Good Samaritan Hospital until 1907. It is now used for storage. Continue on Elm Tree. Just past Third Street on the right is the Old Episcopal Burying Ground (Stop 33). Christ Episcopal Church purchased it in 1832 as a place to bury its parishioners. As a result, many people significant to Lexington&apos;s history are buried here. There is a small chapel in the cemetery, built around 1867, and later used as a sexton&apos;s cottage. The cemetery has not been used since 1870. At the southeast corner of the intersection of Elmtree and East Third Street is the Lyric Theater. Built in 1948, it quickly became the main African-American entertainment venue. Many famous entertainers performed there including Duke Ellington. After the theaters in Lexington became integrated, the Lyric fell on hard times and was closed in 1963. Continue on Elm Tree Lane to East Fourth Street. Turn right on East Fourth to the intersection with Hummons Avenue - immediately to your right - and stop (Stop 34). From about 1869 to 1990, the area about 350 feet to the east of this intersection, and about 1000 feet to the north was called Kinkeadtown, after George B. Kinkead, a wealthy landowner, lawyer, and Transylvania College graduate, who sympathized with the plight of the newly freed slaves. After the Civil War, many freed slaves migrated to Lexington and other cities. Unfortunately, they had few places to choose for housing. Mr. Kinkead acquired the above 11 acres adjacent to his estate, and made it available for home ownership to African Americans who met certain qualifications. The houses built here by the new owners were of the shotgun style - an economical style that former slaves had carried with them from Africa. Kinkeadtown was representative of many other small residential communities throughout the south for the newly freed slaves. By the turn of the century, the original 50&apos; x 100&apos; lots had been subdivided at least by a factor 2 and was mostly rental. While the quality of the neighborhood declined during the 20th century due to the lack of owner occupancy, Kinkeadtown provided housing for over 100 years until being redeveloped in the 1990&apos;s. Hummons Avenue, named for one of the original families that settled in Kinkeadtown to make a new life, was located in close proximity to this intersection. Travel west on East Fourth Street for roughly two blocks until the stoplight at East Fourth and Martin Luther King Boulevard. On the left (southeast corner) is the Living Arts and Science Center (Stop 35). Built in the late 1840s, this is the former home of the aforementioned George B. Kinkead who also served as Abraham and Mary Todd Lincoln&apos;s attorney. On the northeast corner is the Brand-Barrow house, also known as Elmwood and Elmside. The house was built by William Moses Brand, probably in the early 1840s. It was rebuilt for Dr. David Barrow around 1903 and considerably expanded. The varied open interior spaces made the house "one of the most suitable for large-scale entertaining" buildings in Lexington at the turn of the century. It is an interesting amalgam of two periods: the Greek Revival and a turn-of-the-century version of Greek Revival. On the northwest corner at 203 Martin Luther is a house built for another Kinkead, Henry P. Kinkead. Little is known about him other than he served as 5th Sergeant in Morton&apos;s Confederate regiment of the Lexington Guard, and worked as a cashier at First National Bank until 1903. The house was built in 1893. Turn left on Martin Luther King Boulevard and go south crossing Third Street. You are now entering the Constitution Historic District. Constitution is an early Lexington subdivision formed from the town&apos;s first outlots originally occupied by its growing middle class. It contains fewer than 60 buildings on 121 acres. It has remained stable for 200 years and is home to artisans, small businesses, local officials, schools, single and multiple family houses and a church. Continue one block down to Constitution Street and turn right, heading west. Stop at 146 Constitution Street, the East Second Christian Church. Built in 1874, this Gothic Revival, with German Romanesque-inspired elements, was designed by Swedish-born architect Phelix Lundin. The current congregation has been here since 1880 and is one of the oldest African-American congregations in Lexington (organized in 1851). From here, you can see the two buildings at 154 and 158 Constitution. They were built close to the same time, sometime before 1869. While both display some Greek Revival details, the Italianate influence is more apparent on 154. The house at 115 Constitution Street was built in 1831, at the same time the Macalester house at 216 N. Limestone (on the southeast corner of Constitution) was built. Developer-Architect Matthew Kennedy (builder of the original Transylvania University Pavilion building in Gratz Park) was the builder and lived behind Macalester in the frame house at 112-114 Constitution. This property was built in 1813, and is a prime example of American Colonial style architecture. Continue down Constitution Street, which terminates at the stoplight at North Limestone. Turn right on North Limestone, then immediately turn left on Mechanic Street. Continue west on Mechanic, cross North Upper Street, and turn right in the middle of the block at Byway Alley. Travel north on Byway Alley to West Third. Take notice of the historic brick building to your right at the intersection with West Third (210 West Third). Built prior to 1855, it is an interesting survivor of the early cottage style. Turn left on West Third and go one half block to the arched driveway on the right (opposite Gratz Park) that leads into Transylvania University and to Old Morrison (Stop 37). From this stop, one can see the three Victorian houses in Gratz Park, facing North Mill on the west side, at 239-243-247 North Mill. These are called the Goodloe Houses and have in the past been called the "Ugly Sisters", but now are referred to more respectfully as "The Three Sisters". Mrs. William Goodloe built them in 1901 for her three daughters. While their facades differ in their Queen Anne details, their interior floorplans were originally identical. Transylvania University, to your north, started in 1780, in Danville, Kentucky, as the Transylvania Seminary. It is the oldest institution of higher learning west of the Alleghenies. It moved to Lexington in 1789, eventually locating in what is now Gratz Park. They constructed a striking three-story building along with two one-story wings, on each side. The building was designed by Matthew Kennedy in 1816, but burned in 1829. All that remains is the small building on the northeast portion of Gratz Park called the Gratz Park Kitchen. It is now the office of the Blue Grass Trust for Historic Preservation. After the fire, Transylvania moved across West Third and constructed Morrison Hall (now called Old Morrison), which was completed in 1834. Its architect, Gideon Shryock, father of Greek Revival architecture in Kentucky, also designed the Old State Capitol in Frankfort, Kentucky. Also note the Patterson log cabin on Transy&apos;s campus. Continue around the arch to the west side. From there one can see the east side of Gratz Park and the part of West Third between Gratz Park and North Broadway. Directly across the street at 304 West Third is the Hope House, built in 1841. It originally faced North Mill, but was enlarged and re-oriented toward Third Street in 1897. Bark Alley is the name of the alley that runs behind and to the west of Gratz Park. There are two houses at the intersection of Bark Alley and West Third. These are referred to as Thomas January&apos;s little brick house and Thomas January&apos;s log house. Both were built before 1817 and were part of the property that Thomas January owned and used for his large ropewalk that ran between West Third, West Second, North Broadway, and North Mill streets. Turn right on Third and then turn left at Bark Alley. Continue south on Bark Alley until it ends at New Street. On the south side of New Street opposite Bark Alley is a carriage house for the large 1890&apos;s house that used to be on the southeast corner of New Street and North Broadway - now populated by three townhouses. The present carriage house may be an adaptation of an earlier 1850s building. This is an example of an early innovative adaptive reuse from the 1960&apos;s that turned this carriage house into an exciting, innovative, award winning residence - one of the most imaginative adaptive reuses in Lexington. Turn left (east) on New Street. It is one-way going in the opposite direction (west) from your direction. If traffic is heavy, please walk on the sidewalk rather than riding in the roadway. Continue traveling east for the half block intersecting with North Mill Street. Turn right (south) on North Mill Street. On the southwest corner of this intersection at 231 North Mill is Mt. Hope, also known as the Gratz House. Built in 1819 and purchased by Benjamin Gratz in 1824, the property remained in the Gratz family until 1985. Next to it is the Victorian-eclectic Dudley house at 215 North Mill (built in 1879), and finally next to that is the Hunt Morgan House where your tour began. Take time to walk around Gratz Park. The Blue Grass Trust for Historic Preservation is a non-profit advocate for historic preservation that strives to protect, revitalize and promote the special historic places in our community to enhance the quality of life for future generations. The Blue Grass Trust is guided by three tenets - education, service and advocacy.